> Research Library > KPMG > Are you paying too much for cloud? 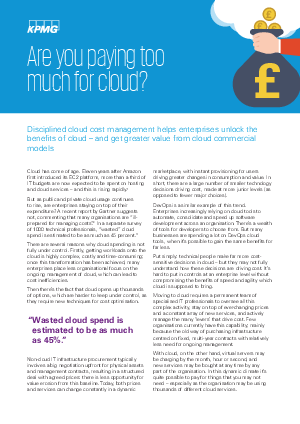 As IT spend on cloud continues to rise, one survey of technical professionals estimated as much as 45% could be wasted. Is your organisation staying on top of expenditure? • which five levers to use to manage costs – and the potential reductions each can deliver.